The shots inside Eat ‘n Park’s test kitchen were lit with 3, 1200 watt Arri HMI’s located outside the kitchen’s windows. To create a warm feel of early morning sunlight, we put CTO gel on the HMI’s. The interior fill light was from 12″ x 12″ daylight balanced LED panels. I manually set the AF100’s color balance to 4700K to keep the warm feel without going too yellow or orange. Most of the kitchen scenes were shot from a Fisher 10 crab dolly. For the pie cutaways, I mounted my AF100 on a small, homemade tabletop dolly with skate wheels. I used my Olympus 14-35mm F2 lens for the wide and medium wide shots and an older Canon 85mm F1.2 FD lens for close-ups. A few of the in-restaurant scenes were filmed from the Fisher crab, but for most I used a Manfrotto mono-pod. This created a more spontaneous and unpredictable feel to the back and forth dialogue. Most of these scenes were shot with a EF series, Canon 24-70 F2.8L lens, wide open at F2.8. All the in-restaurant footage was lit with HMI’s outside the restaurant and LED panels and white bounce cards inside. We exchanged all the warm-white CFL bulbs for 5000K lamps. The second portion of the video is a movie theater ad that plays between shows in hundreds of theaters in Western Pennsylvania. I shot this simple on-camera delivery spot at the end of our shoot day. The biggest trend in commercial production is to create images with very shallow, film-like depth-of-field. This “look” was easy with 35mm movie film. As a general rule, the larger the film frame or imaging device, the “tighter” the depth-of-field and more selective the focus. 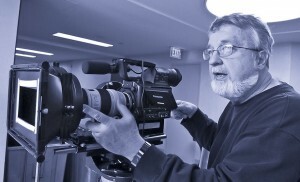 This contrasts with previous HDTV digital cameras that achieved sharp focus throughout the entire frame. Although I love film and have shot over 2,000,000 feet of it… today’s budget for a typical spot doesn’t have the luxury of $10K to $20K for 35mm film stock, processing, HDTV transferring and sync-ups. Using “film-like” shallow depth-of-field to separate actors or products from a scene’s background can now be achieved with new, cost-effective cameras from Sony and Panasonic. They use large scale digital imagers that approximate the size of 35mm film negative. Since these cameras record to solid state memory, there’s no added size, weight or expense related a tape mechanism.